Council Members, Front Row (ascending stairs) Julie Hall Friedman (Fairhope), Jim Harrison III (Vice-Chairman, Tuscaloosa), Dr. Rachel Brown Fowler (Birmingham), Lisa Blach Weil (Chairman, Long-Range Planning, Montgomery), Ceil Jenkins Snow (Birmingham), Lynne Berry Vallely (Huntsville), Warren L. Duncan (Tuskegee), Al Head (Executive Director 1985-2018), Montgomery, Barbara Edwards (Deputy Director 1978-2018), Montgomery. 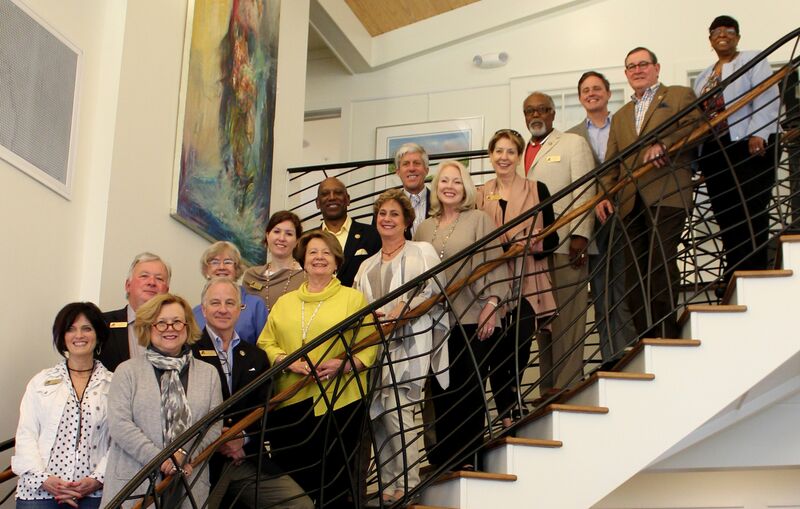 Back Row (ascending stairs) Kim Vice Mitchell (Decatur), Doug Purcell (Eufaula), Mary Wadsworth White (Florence), Neely Portera (Tuscaloosa), Dr. Henry Panion III (Secretary, and Grants Review Chairman, Birmingham), Joel T. Daves IV, (Chairman, Mobile) and John C. Coleman (Dothan). Not pictured: Sontonia T. K. Stephens (Tuscaloosa). ASCA is the official state agency for the support and development of the arts in Alabama. The agency supports not-for-profit arts organizations, schools, colleges, units of local government, non-profit organizations programming in the arts for the general public, and individual artists. The Council is a body of fifteen members appointed by the Governor for six-year terms to help promote the arts statewide. A primary responsibility of the Council is to make decisions on grants awarded to support art programs and arts education throughout the state. Members come from diverse areas of the state and backgrounds, ranging from arts educators, to professional artists, to community arts volunteers. The Alabama State Council on the Arts (ASCA) receives an annual appropriation from the Alabama Legislature and additional funds from the National Endowment for the Arts, a federal agency.